Happy New Year Everyone! 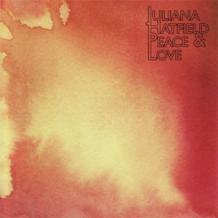 In this week's Artist Spotlight I am going to share a review of Juliana Hatfield's 10th studio album Peace & Love. Do you remember Juliana? Juliana Hatfield is an American musician/author who has been in the music industry since the mid eighties to today. "who is Juliana Hatfield, you may be asking?" You may remember the songs off 1993 album Become What You Are, My Sister or Spin The Bottle (from the Reality Bites Soundtrack) What the biggest surprise you may have now is in knowing that Juliana has been making great music for over seventeen years since then. The latest albums How to Walk Away & Peace and Love are a new territory and a pleasant change in her sound direction. Juliana has her own label Ye Olde Records which the last two albums have been released on. She has put a lot of time into her latest projects releasing her Memoir: When I Grow Up and releasing new songs via download from her website. (donation) She has given so much back to her fans by communicating through her blog which has been a great resource to get insight into her life as a musician. "Juliana and her guitar" - This is when she is at her best. This album has been produced entirely by Juliana herself. An acoustic set of songs mainly, a stripped down sound which comes across as bare, basic and pure. Juliana is very sharing in her personal feelings and experience, she does not shy away from relaying to her fans in Peace and Love. A laid back atmosphere is present throughout the songs. The best way to describe the feeling of listening to the album throughout is to have Juliana and her guitar in your living room playing by an open fire in the dark. There is so much intimacy with the music. Juliana has very strong vocals to match the efforts of playing all of the instruments entirely by herself. This is arguably the most mature album by Juliana as it is so different from her back catalogue of albums. Simplicity can sound really good when you have been making music for over 24 years. The lyrics on this album make Peace & Love an enjoyable experience. Evan is about Juliana's feelings towards Evan Dando (The Lemonheads) She has collaborated and lived with him early in her career. It is a very honest song which shares the mood of the songs. I Picked You Up is a very well written piece which flows nicely and is a strong track. The End Of The War is another highlight at the beginning of the album with its raw emotional burst. If you are wanting to hear an acoustic, unplugged Juliana Hatfield project then this album is the one for you.